Six mega-trends are combining to persistently drive gasoline prices higher until price kills demand. Peak Fracking. Peak Fracking occurred in June 2015. In the year since Peak Fracking, US oil production decreased by one million barrels per day (mb/d). To put this change in perspective, the 1973 Oil Embargo, a 1.2 mb/d reduction for 6 months, caused oil prices to quadruple. The decrease in US oil production is forever. Net Energy of new sources of oil are less than 5:1, off the Energy Cliff. Here is an excellent summary of Energy Economics, 19 minutes. Bankruptcies will reduce access to capital in a capital intense industry. The current drilling rig count is 420. Frackers are $200 billion in debts and behind on payments. Access to capital to drill more wells will be complicated by current debts, high extraction costs, and short life of fracked wells. The US Government has few friends among oil exporters. The US did nothing to reign in the fracking boom and the consequence of low oil prices that harmed the economies of oil producing nations. It is highly improbable that those same nations will or can increase production to keep oil prices low as US oil production depletes. Example: Saudi Arabia threatens to dump US bonds. The net of these trends is that oil/gasoline will likely never again be at the February 2016 lows. As a warning to investors, EIA (Energy Information Administration) and IEA (International Energy Agency) data is reliable; however, their judgment is politically motivated. 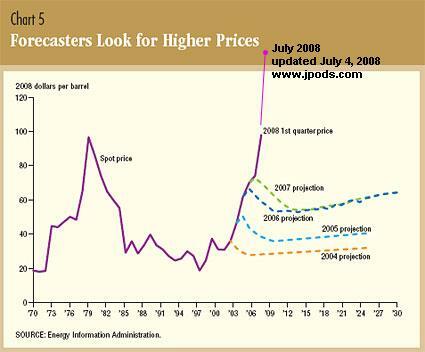 Here is a graph by the Dallas Federal Reserve of EIA repeated under forecasting the price of oil as the 2008 economic collapse approached. In the graph to the right, I erased the brown part of EIA's current forecast to reflect that Peak Fracking occurred in June 2015. 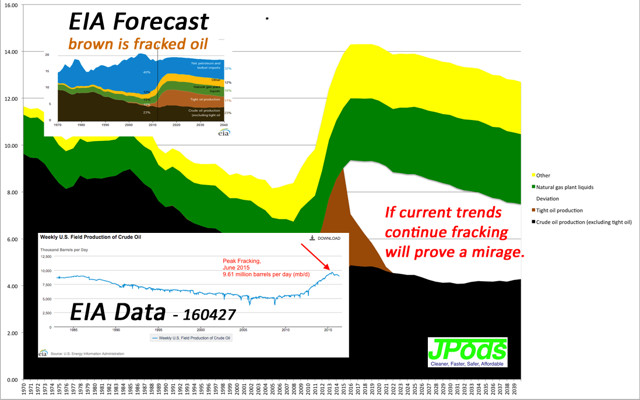 There is a huge (White area) gap in their forecast if Fracking depletions continue. EIA has failed to warn the nation of the economic consequences of Peak Fracking. This provides investors a knowledge gap. Peak Oil, a 2005 documentary by ABC Australia. These mega-trends will force oil prices higher much faster than most believe. Also, there is no "glut" of oil. The market need is to power a 365-day food cycle. The reported "glut" is a storage problem of having 33.8 Days of Supply, 10 days more than the 24 Days of Supply typical for the past decade. Economic fragility is created by not having 365 Days of Supply to meet the needs of a 365-day food cycle; Examples: 1973 Oil Embargo, 1979 Iranian Revolution. Having 33.8 Days of Supply is only a 9% safety factor on a survival need. Take away the 18 Days of Supply required to fill pipelines and there is a 4% safety margin on a non-elastic survival need. Fragility is extreme. In July 2008 the EIA’s This Week in Petroleum indicated the low inventories circled in the above graph. Gasoline inventories in the US Southeast were so worrisome that a Seeking Alpha article was published on the economic risk. In September 2008 that inventory fragility hit the market, "Frustration in the South as a Gasoline Shortage Drags On". Note, the EIA issued no warning of risk. led 3-days inventory out of the whole system (green circles in the following 5-year inventory band (blue area). Current gasoline inventories (right) are only 5-Days Supply above where outages occurred in Sept 2008. The petroleum companies are extraordinarily well run. They are spectacular examples of "just-in-time" efficiency. This "just-in-time" skill does not diminish the 365-day market need. As awareness of Peak Fracking grows, I believe people, at every level of the supply chain, will stockpile more to meet the 365-day market need. Also, as prices rise, my guess is that Frackers will slow pumping as higher prices helps them make bond payments. Stockpiling and slower pumping will amplify the rate of price change. I follow energy intensely in my efforts to retool transportation but do not trade in oil and gas. So my estimate that ETF (NYSEARCA:UGA) will consistently increase from its February 2016 lows of $20.40 is not connected to my personal investments. Logistics have mass and momentum. The current mass and momentum -- debt, stacked drilling rigs, and depleting oil wells -- will ratchet the price of oil higher for at least a year. I completely agree with the Saudis that the "Post-Oil Era" is at hand. Life requires energy. Less affordable oil energy will dramatically affect long-term investing.